Sea level change is a high-profile aspect of climate change. During the 21st century, the average global sea level is expected to rise considerably faster than in the 20th century, even if a common conclusion from all the coupled atmospheric-ocean general circulation models is that sea level change will be far from uniform. The coastal zone, with ecosystems such as seagrass, mangroves, and tidal marshes are therefore already under severe sea level rise (SLR) pressure which is additionally amplified due to worldwide existing intensive anthropogenic activities highly concentrated in the coastal zones. However, the importance of preserving salt marshes and the services they provide are being increasingly recognized and wetlands have become the target of several international initiatives and conservation regulations. Salt marshes are specifically listed as habitats of “community interest” or “priority habitats” in Annex I of the Habitats Directive adopted by the European Commission. Being positioned at the interface between land and sea, salt marshes are likely to be particularly vulnerable to SLR. According to the Intergovernmental Panel on Climate Change Fifth Assessment Report (IPCC AR5), SLR is predicted to increase by 30–100 cm by 2100 and will thus reshape coastal wetlands globally. This is of particular concern in all those areas (e.g., the Mississippi Delta or the Venice Lagoon) where sediment accretion rates are too low as to compensate for relative SLR. In particular, accelerated SLR is likely to affect the salt marsh halophyte vertical distribution: depending on the level of change; some communities may adapt to sea level rise while others may either disappear or migrate inland (provided that there is suitable area inland). Projecting future changes is thus a crucial step towards planning for and mitigating the impact of climate change on biodiversity. The Venice Lagoon is particularly well suited to such a study, since, given its wide area (about 55,000 ha) and its hydro-morphology, the system is characterized by considerable natural spatial heterogeneity, leading to a mosaic of habitats and multiple environmental gradients. Moreover, the entire zone has experienced notable geomorphological and ecological changes due to the combined effect of land subsidence, mostly anthropogenic, with sea level rise and severe weather events, strongly linked to regional/global climate change. However, the ancient urban ecosystem of Venice and its lagoon is among the most intensively studied urban and environmental systems in the world. 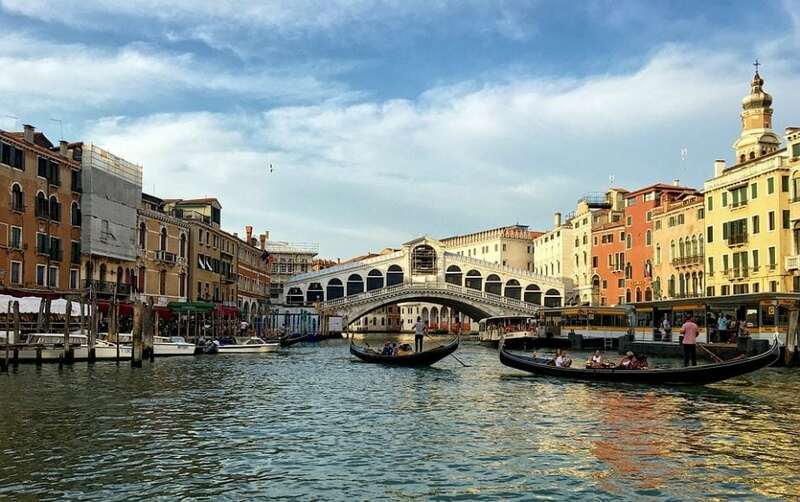 Being a densely populated and infrastructure-rich coastal city and due to its charismatic cultural heritage, the city of Venice is a hot topic in the climate change impact studies. However, there are still gaps in our knowledge about how the salt marsh communities in the region will react to SLR since previous studies either were restricted to very small areas or relied on simplified data where the vegetation map was based on remotely sensed signals, rather than on detailed field surveys. Here we employ the best available data on recorded occurrences of all habitats (1:5000 vegetation map) to generate a statistical model describing turnover in habitats as a function of relevant environmental gradients and SLR. Habitat turnover was modeled based on a fine-scale vegetation map, relative micro-elevation measurements, and most relevant environmental data (subsidence and accretion) connected with SLR. Three model-based SLR scenarios (GFDL P50, RCP4.5, RCP8.5) and the locally obtained linear trend were considered. Results indicate that the upcoming climate conditions could significantly affect salt marsh habitat cover and spatial arrangement in the Venice Lagoon trough SLR. Although nearly all habitats evidenced a decrease in their extent by 2050 and beyond, our results also suggest that different types of marshes will respond differently to estimated rising sea levels. Various physical properties (e.g. the vicinity of river mouths, wave energy which re-suspends sediment) of the northern and southern areas of the lagoon revealed a clear difference in the accretion rate. When this data was incorporated into the model, the submergence risk proved to be quite different for the two areas. In the northern lagoon, the salt marsh habitats will probably disappear by 2075, but in the southern area in some parts, habitat types could maintain a dynamic equilibrium between accretion and sedimentation vs. relative sea level rise, even in the second half of the century. 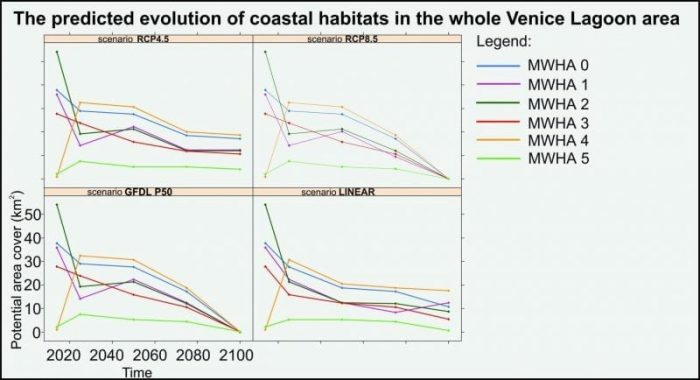 By 2075, 37% to 48% (model-based scenarios) or even 51% (linear scenario) of the Venice lagoon coastal habitats could lie under water. The general reason is that the available sedimentary coast of all micro-altitude is strictly limited owing to anthropogenic barriers. The SLR in the Venice Lagoon will mean not only irreparable damage to the historic city of Venice itself and severe economic damage to the port of Venice but an alarming threat to the largest coastal wetland area in the Northern Adriatic, which calls for special conservation countermeasures. Compared to wetlands in low SLR and constant sedimentation, changes in the Venice Lagoon’s marsh system are rapid, and quick action is required. Thus, geospatial models with applicable high spatial resolution result estimating the potential development of wetland habitats under climate change are urgently needed, in order to prepare proper conservation measures and management strategies at an opportune moment. Exactly this information is provided in our study and the applied cost effective methodological approach is transferable to other temperate areas, where wetlands experience comparable rates of SLR. The main requirements are: (1) an accurate habitat type map (vector or raster format), (2) a representative number of GNSS elevation measurements in each habitat type, and (3) SLR data (freely available). However, other predictors can be included into the model as well, but the contribution and effects of these variables are beyond the scope of this study. Rising sea levels will reshape the Venice Lagoon’s coastal habitats. Salt marsh vegetation could disappear under GFDL P50 or RCP8.5 climate scenarios. Differences in habitat dynamics between the N and S regions of the lagoon are evident. The methodological approach is applicable in other temperate tidal marshes under SLR. Geospatial results serve for strategic spatial planning and policy management. 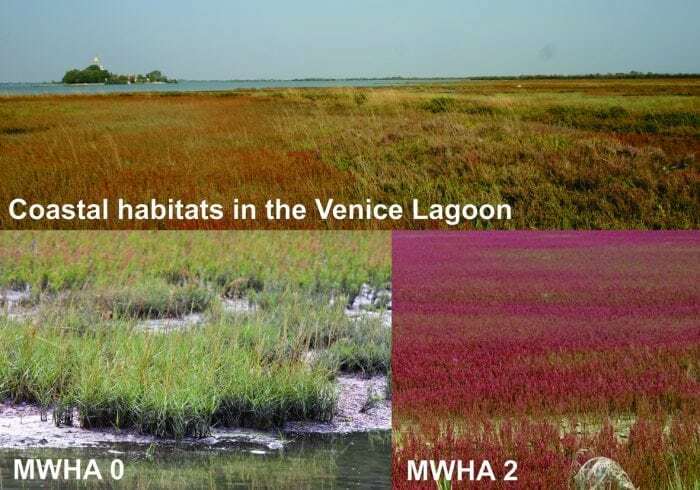 These findings are described in the article entitled The fate of coastal habitats in the Venice Lagoon from the sea level rise perspective, recently published in the journal Applied Geography. This work was conducted by Danijel Ivajnšič and Mitja Kaligarič from the University of Maribor, and Edy Fantinato, Silvia Del Vecchio, and Gabriella Buffa from Ca’ Foscari University of Venice. Danijel Ivajnsic is an Assistant professor at the University of Maribor, Faculty of Natural Sciences and Mathematics · Department of Biology.